I have heard a lot about the Me 262 but little or nothing about the Me 163 Komet. 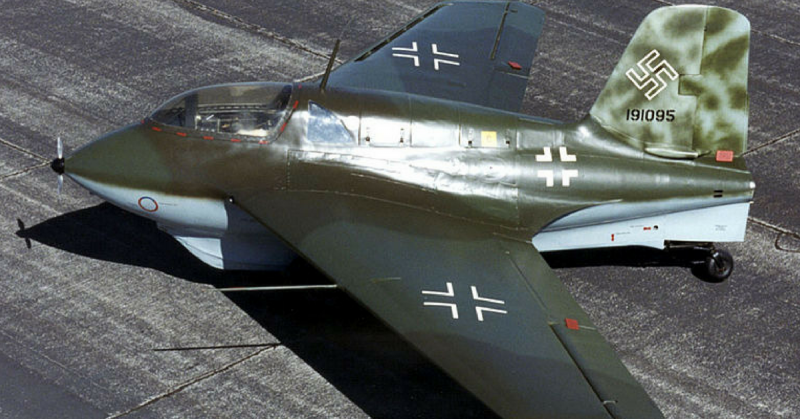 When it took to the skies in 1944, the Messerschmitt Me163 Komet looked like something out of a science fiction serial. One of the stranger aircraft of World War II, it combined advanced technology with a curious design that set severe limits on what it could do. The Me163 looked distinctly different from any other plane in action in WWII. Its bulbous front tapered back to a body more in keeping with a conventional plane design. This created a shape similar to those of rocket ships in science fiction comics, but with wings and a large tail rudder. The wings themselves were unusual at the time, though it would not be obvious to modern eyes. Most planes of the era had a single pair of straight wings. 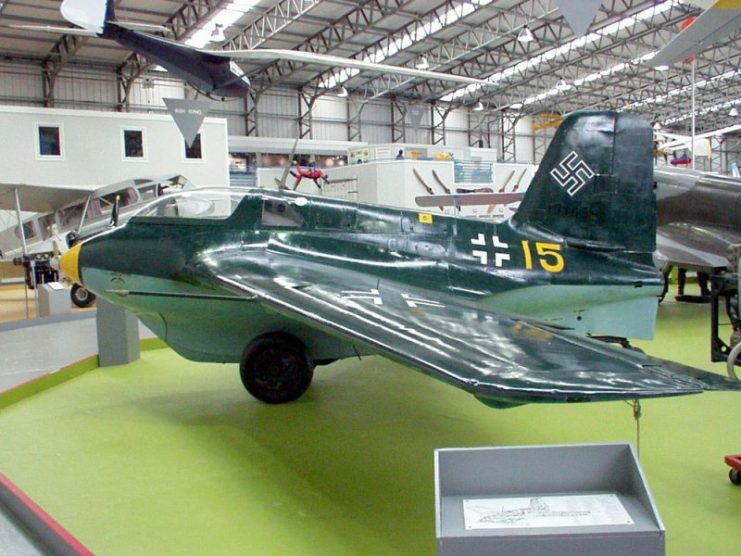 The Me163 was one of the first aircraft to use swept-back wings, a design that would become popular over the following decade. The Me163 was the creation of Dr. Alexander Lippisch. 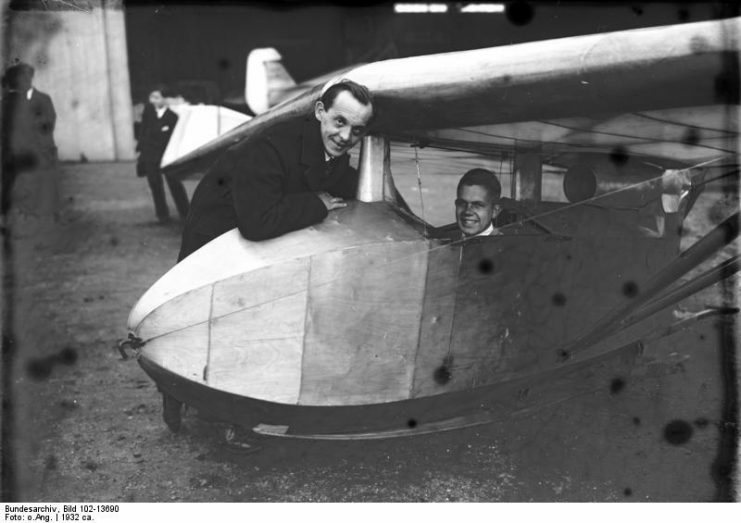 Lippisch had been a pioneer of glider design during the 1920s when he had developed tailless gliders. On joining the Messerschmitt company in 1939, he brought with him his expertise in this area and applied it to create a new kind of interceptor for the Luftwaffe. The Me163 had its first test flight in June 1940. As befitted this experimental weapon, the test took place at the secret weapons research facility at Peenemünde, the home of Nazi rocket research. The plane handled very well on that first flight, leading to further tests in which the prototype achieved a steep climb rate and speeds of up to 340mph. More prototypes with improved engines followed, eventually reaching speeds of 623mph – 250mph faster than a Mark V Spitfire. Though the powerful engine allowed for even higher speeds, these produced problems with stability, so further modifications were made for greater safety during high-speed flying. 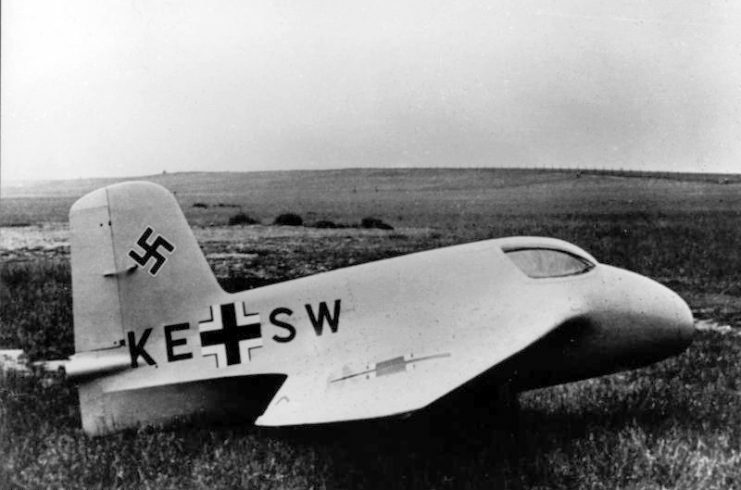 The Me163 started out as an adapted version of the DFS 194 research glider. The designers added a Walter rocket motor, powered by two liquids which ignited when combined. By controlling the violent reaction that resulted from mixing them together, the rocket in the original prototype produced around 880lb of thrust. As the rocket was improved, this thrust was almost doubled, impressively increasing the Me163’s speed. 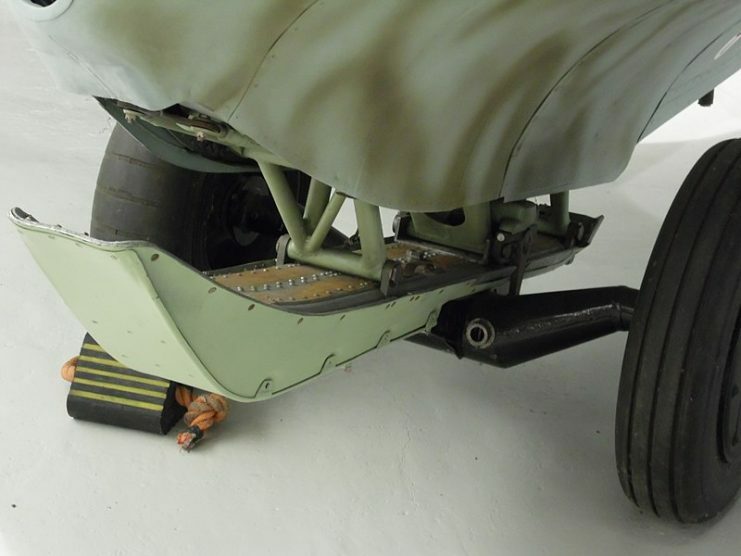 Because of its origin as a glider, the Me163 did not have a fixed undercarriage. Instead, it took off using a wheeled dolly which it left behind on the ground. 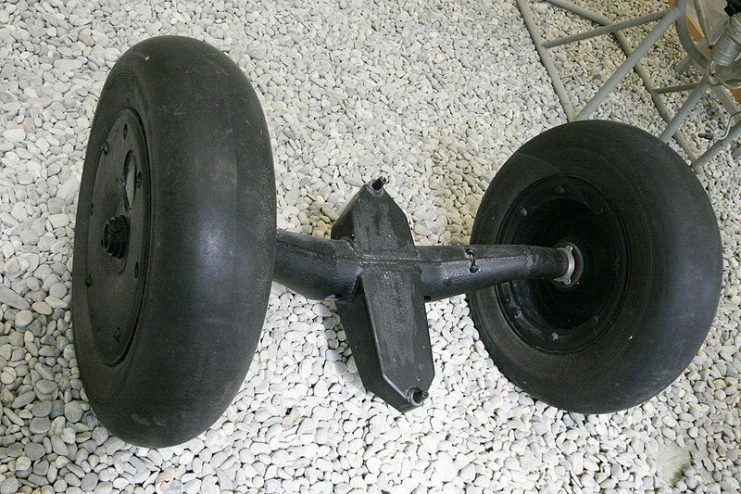 To land, it used a sprung skid. Between its unusual gear and its volatile fuel, takeoffs and landings with the Me163 could be very hazardous. 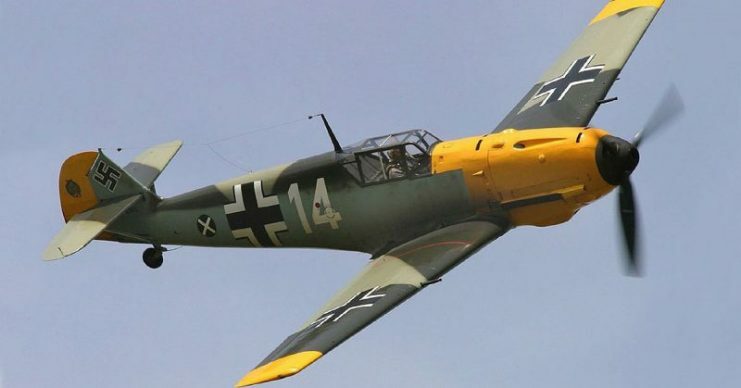 The percentage of accidents Me163s suffered on landing was relatively high, but still lower than that of the most prevalent Messerschmitt fighters of the war, the Bf109. The other major downside of the rocket-glider approach was that the Komet’s engine could produce only seven and a half minutes of thrust. Once that was over, the pilot had to make an unpowered glide back to base. This made the plane extremely vulnerable after its initial burst of speed. If an enemy attacked, all the pilot could effectively do was to try to land as soon as possible. The Me163 Komet first went into battle on 28 July 1944. 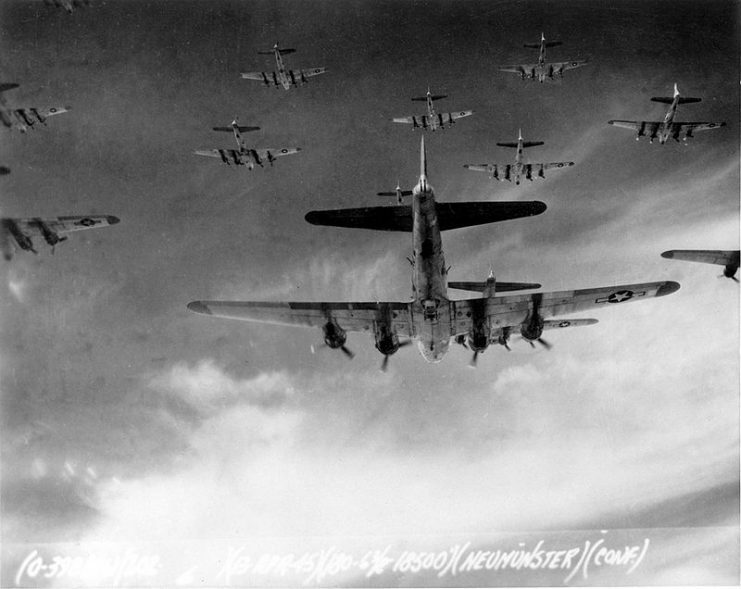 Six fighters from 1/Jagdgeschwader 400 intercepted a group of Flying Fortresses from the United States Army Air Force on their way to bomb oil refineries at Leuna-Merseburg. The attempt to tackle the American planes proved ineffective, as it was hard to direct the Me163’s guns against them. The main reason for this was the incredible speed at which the Komet moved. Closing in so fast, a pilot had only a three-second window in which to fire on the enemy before he raced past. With each of the Komet’s 30mm cannons only carrying 60 rounds, the pilots didn’t have many shots or much time to spare. B-17 Flying Fortresses from the 398th Bombardment Group on a bombing run. To overcome this problem, Komet pilots developed a new approach to intercepting Allied bombers. They flew above them at high speed, then swept down, gliding into the attack. While the Me163’s pilots were extremely aware of its limitations, the picture looked different on the other side of the sky. The incredible speed, heavy cannon, and sudden attacks of the Me163 struck fear into Allied bomber pilots. It seemed as if they were being attacked by a plane from out of the future. 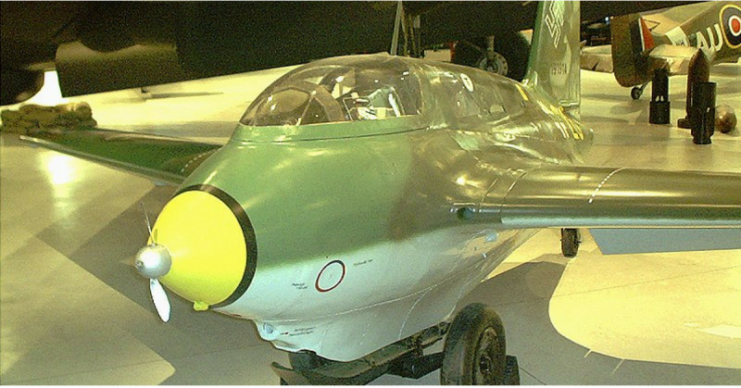 One of the ways in which German engineers tried to make the Me163 more effective was to fit it with a new and unusual weapon – the SG 500 Jagdfaust (“fighter fist”). This consisted of ten firing tubes, five in the root of each wing. Each tube faced upward and contained a 50mm shell. A photo-electric cell detected the shadow of another plane passing overhead and triggered the weapon, firing all ten tubes at once. To use this weapon, all the Me163 had to do was to fly under an enemy plane. It proved its potential in April 1945 when a Me163 destroyed a B-17 Flying Fortress using the Jagdfaust. Me 163B at the Canada Aviation and Space Museum. The tiny propeller drives a ram air turbine that provided electrical power. In 1943, Germany provided the Japanese with manufacturing rights to produce their own version of the Me163. The plans were sent to Japan in two submarines, but one of these was sunk on the way. Left with incomplete schematics, the Japanese still managed to produce prototypes but were not able to get them into action before the war ended. 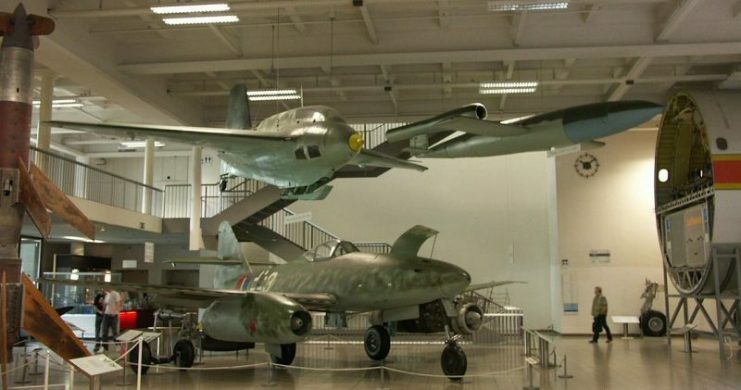 In Germany, the Me163 arrived too late to live up to its full potential. By the time the Jagdfaust turned the Komet into an effective anti-bomber machine, the war was almost over. The 300 Me163s that entered service only destroyed nine bombers. Though it was the most futuristic plane of the war, the Me163 was ultimately not the most effective.